The Jaeger-LeCoultre company was born in the Swiss Jura Mountains in 1833. Since their inception, they have maintained a steady presence among the world's leading manufacturers of elegant timepieces. Today, the company boasts an impressive collection of watches ranging in a variety of styles serving the luxury market. A remarkable number of innovations have come from the watchmakers of Jaeger-LeCoultre, firmly establishing their legacy as pioneers of the industry. * In 1844, Antoine LeCoultre invented the millionometer, allowing measurements to the nearest micron. In 1847, he invented the first crown winding system, eliminating the need for a winding key. * The world's thinnest pocket watch movement, at a mere 1.38 mm, was invented by the company in 1903 and still holds the record. * The company's featured item is the Reverso, a wristwatch that has a swivel case. It was first introduced in 1931. Future versions of this design would feature the time of one time zone on one side and time in another zone on the reverse. 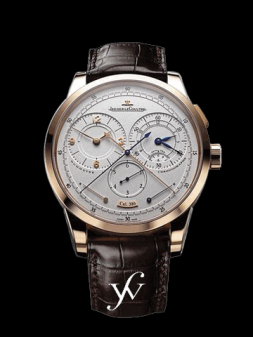 * In 1953, the first automatic alarm wristwatch was invented by LeCoultre. Master Grand Reveil This exquisite watch combines two complications: a mechanical alarm and a perpetual calendar. It is even fitted with a ring and vibrating mode for the alarm function, a four-digit indication of the year, and display of the moon phase for both the northern and southern hemispheres. This watch comes in 18 ct. yellow gold case with a yellow gold folding buckle, and a black crocodile strap. Jaeger LeCoultre Reverso Classique This fine watch features the popular Reverso design. The polished steel case, set inside a larger carriage, rotates a full 180 degrees to show the engraved caseback. It has a manual movement, with a white dial and Arabic numerals. The decorative fluted detail on the bezel provides additional style. The case and buckle are 18K yellow gold; the strap is brown crocodile leather. The combined result: perfection.